MANCHESTER, England (AP) — The U.S. women’s soccer team is back in the Olympic gold medal match after a wild come-from-behind 4-3 win over Canada with a goal in the final minute of extra time. Now the Americans will be out to avenge one of the most gut-wrenching losses in the program’s history. Alex Morgan gave the U.S. its first lead of the night in the third minute of injury time Monday, completing the win over Canada in the Olympic semifinals at Old Trafford. Morgan’s 6-yard header, on a long cross from Heather O’Reilly, looped high into the net over goalkeeper Erin McLeod for the winning goal. Megan Rapinoe scored in the 54th and 70th minutes, and Abby Wambach in the 80th for the U.S. The Americans overcame a hat trick from Christine Sinclair, who scored in the 22nd, 67th and 73rd minutes for Canada. Next comes the game the U.S. players have been eyeing for more than a year, a rematch with Japan on Thursday at Wembley Stadium with gold on the line. The top-ranked Americans lost to Japan on penalty kicks in the World Cup final last summer, a stunning blow that became a source of motivation as the players prepared for this year’s Olympics. The U.S. team has played in the title match in every Summer Games since women’s soccer was introduced in Atlanta in 1996, winning the gold in 1996, 2004 and 2008 and the silver in 2000. The Americans advanced by continuing its dominance of the neighbor to the north, extending its unbeaten streak against Canada to 27 games (23-0-4). The Americans lead the all-time series 44-3-5, the last loss coming at the Algarve Cup in 2001. But it wasn’t easy. Sinclair was an imposing force, scoring her 141st, 142nd and 143rd goals in international play. She’s now even with Wambach for No. 2 on the all-time list, both chasing Mia Hamm’s world record of 158. Canada coach John Herdman said before the game that the run of futility against the Americans was on the minds of his players, and he addressed it with them in the run-up to the match. He also injected some pregame intrigue by accusing the Americans of using “highly illegal,” overly physical tactics on free kicks and corner kicks. Certainly, his team gave one of its most spirited efforts on the biggest stage ever for a game between the neighboring rivals, scoring the most goals the U.S. has allowed since a 5-4 win by the Americans over Australia in May 2008. The game included a pair of goals resulting from moments rarely seen in soccer, including a corner kick that curled in for a goal and a goalkeeper whistled for holding the ball too long. The Americans dominated possession in the early minutes, but then the U.S. defense did the unexplainable — it lost track of one of the top goal-scorers of all time. Marie-Eve Nault played a ball ahead to Melissa Tancredi, who tapped a pass over to Sinclair. Sinclair then slalomed through the penalty area, maneuvering around defender Kelley O’Hara to beat goalkeeper Hope Solo with simple right-footer from 10 yards. It was the first goal allowed by the U.S. in more the 360 minutes, since a pair of early scores by France in the Olympic opener two weeks ago. The U.S. also trailed at halftime for the first time in this tournament. The Americans found an unconventional way to pull even early in the second half, with Rapinoe scoring directly on a corner kick. She curled the ball just inside the near post, glancing off the legs of defender Lauren Sesselmann and goalkeeper McLeod as it settled in the net. Then came a wild sequence of three goals in six minutes. The Tancredi-Sinclair combo worked again, with Sinclair heading Tancredi’s cross just inside the post from 10 yards to put Canada ahead 2-1. Three minutes later, Rapinoe got her second, launching a right-footer from the edge of the area and off the post. Then it was Tancredi again, leaping high to head in a corner kick, again just inside the post for goal No. 143, moving her temporarily ahead of Wambach. Wambach got even with Sinclair — and tied the game — with a penalty kick resulting from an unusual call: McLeod was whistled for holding the ball more than six seconds, giving the Americans an indirect free kick inside the area. Rapinoe took the kick, and it glanced off the arm of Nault. 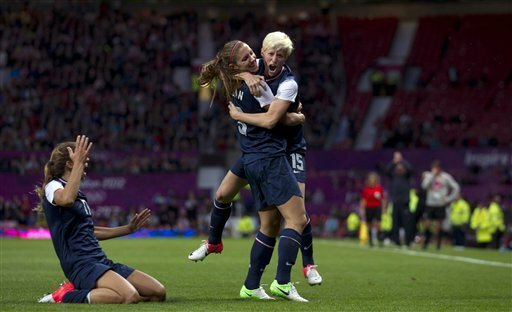 The referee awarded the spot kick, which Wambach converted off the left post in the 80th minute. The game became a battle of attrition in extra time, with the Americans having the better of the chances. Wambach put a header off the crossbar in the 119th minute. The officials then declared there would be three minutes of injury time, just enough for Morgan to put one in and avoid the penalty kick shootout.